Saratoga County is a county located in the U.S. state of New York. As of the 2010 census, the population was 219,607. It is part of the Albany-Schenectady-Troy Metropolitan Statistical Area. The county seat is Ballston Spa. The name is a corruption of an Indian word "sah-rah-ka" or "Sarach-togue," that means "the hill beside the river." 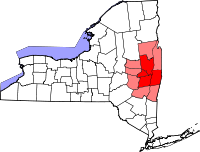 When counties were established in the Province of New York in 1683, the present Saratoga County was part of Albany County. This was an enormous county, including the northern part of New York State as well as all of the present State of Vermont and, in theory, extending westward to the Pacific Ocean. This county was reduced in size on July 3, 1766 by the creation of Cumberland County, and further on March 16, 1770 by the creation of Gloucester County, both containing territory now in Vermont. In 1786, Albany County was reduced in size by the splitting off of Columbia County. In 1791, Saratoga County (as well as Rensselaer County) was split off from Albany County. During the nineteenth century, Saratoga County was an important industrial center. Its location 30 miles north of Albany on the Delaware and Hudson Railway and its proximity to water power from the Hudson River and Kayaderosseras Creek led to rapid industrial development beginning in 1810. Some of the most important industries were paper mills, tanneries, foundries, and textile mills. According to the U.S. Census Bureau, the county has a total area of 844 square miles (2,190 km2), of which 812 square miles (2,100 km2) is land and 32 square miles (83 km2) (3.78%) is water. As of the census of 2000, there were 200,635 people, 78,165 households, and 53,699 families residing in the county. The population density was 247 people per square mile (95/km²). There were 86,701 housing units at an average density of 107 per square mile (41/km²). The racial makeup of the county was 95.98% White, 1.36% Black or African American, 0.18% Native American, 1.04% Asian, 0.02% Pacific Islander, 0.42% from other races, and 1.00% from two or more races. 1.41% of the population were Hispanic or Latino of any race. 19.6% were of Irish, 16.2% Italian, 11.4% German, 10.2% English, 7.2% French, 5.9% Polish and 5.4% American ancestry according to Census 2000. 95.2% spoke English and 1.4% Spanish as their first language. There were 78,165 households out of which 33.60% had children under the age of 18 living with them, 56.20% were married couples living together, 9.00% had a female householder with no husband present, and 31.30% were non-families. 24.50% of all households were made up of individuals and 8.50% had someone living alone who was 65 years of age or older. The average household size was 2.51 and the average family size was 3.01. In the county the population was spread out with 25.00% under the age of 18, 7.80% from 18 to 24, 31.50% from 25 to 44, 24.20% from 45 to 64, and 11.50% who were 65 years of age or older. The median age was 37 years. For every 100 females there were 97.20 males. For every 100 females age 18 and over, there were 94.60 males. The median income for a household in the county was $49,460, and the median income for a family was $58,213. Males had a median income of $40,901 versus $29,583 for females. The per capita income for the county was $23,945. About 3.80% of families and 5.70% of the population were below the poverty line, including 6.50% of those under age 18 and 5.80% of those age 65 or over. Saratoga County is governed by a Board Of Supervisors, with each town Supervisor acting as the representative from that community. The City of Saratoga Springs elects two Supervisors and the City of Mechanicville elects one supervisor to sit on the Board of Supervisors, but have no power on their respective city. The Town of Clifton Park also elects two Supervisors, one being the elected Town Supervisor, and one having only County duties. Voting is by weighted vote of each of the communities based on population, which is the reason why Saratoga Springs and Clifton Park, the two largest communities in Saratoga County, elect two Supervisors. The Political makeup of the 2012-2013 Board is 19 Republicans, 3 Democrats, and 1 Independence Party member. Republicans hold the county-wide offices of Sheriff, District Attorney, County Clerk, Treasurer, and Judges of the County, Family, and the Surrogate Courts. Saratoga County has usually been a Republican leaning county in most major elections. George W. Bush won the county narrowly in 2004 with 53% of the vote, while Barack Obama slightly edged out John McCain in 2008, receiving 51% of the vote countywide becoming the first Democrat to win Saratoga County since 1996. The majority of the county is represented in Congress by Republican Chris Gibson, with the exception being the town of Waterford, which is represented by Democrat Paul Tonko. In the State Senate, the county is divided between Republicans Roy McDonald and Hugh Farley, while in the State Assembly Democrats Ronald Canestrari and Robert Reilly, along with Republicans James Tedisco, Teresa Sayward, and Tony Jordan each represent portions of the county. James A. Murphy III, a Republican, is the District Attorney. Democratic strength is best shown in the City of Saratoga Springs, which has voted Democratic in every presidential election since 1988. Republican strength is concentrated in the western part of the county, which is mostly rural or exurban. In 2005, the Democrats gained a majority on the Saratoga Springs City Council after decades of Republican dominance. The Republicans, however, reclaimed the council majority in the 2007 General Elections due to a split Democratic Party in the mayor's race. In 2009, the Republicans reclaimed their supermajority (4-1) on the City Council, by winning every contested election (Mayor, Finance, Public Safety, and Public Works). In 2011, Democrats reclaimed the Majority on the City Council, while Republican Scott Johnson was reelected as Mayor. At the Saratoga County Board of Supervisors, The City is split, with one Republican and one Democrat holding the two Supervisor seats. Saratoga County is extremely popular between late July and early September each year due to the Saratoga Race Course being open. This world-famous track dates back to 1863. Horse-racing fans come from all over to watch the races. Besides the horses, Saratoga County is also known for its role in American History, being the home of the Battle of Saratoga<The Saratoga National Historical Park is located along the Hudson River in Stillwater, and features a drive-around trail where you can drive up to each station. The park is also famous for its outstanding views of the area's natural scenery and Vermont's Green Mountains in the distance. ^ "Saratoga County Quickfacts". U.S. Census Bureau. http://quickfacts.census.gov/qfd/states/36/36091.html. Retrieved 2012-08-20. Sylvester, Nathaniel Bartlett (1878). History of Saratoga County, New York, with illustrations biographical sketches of some of its prominent men and pioneers. Philadelphia, PA: Everts & Ensign. OCLC 3858600. http://www.archive.org/details/historyofsaratog00sylv. Retrieved 2011-09-06. This page uses content from the English language Wikipedia. The original content was at Saratoga County, New York. The list of authors can be seen in the page history. As with this Familypedia wiki, the content of Wikipedia is available under the Creative Commons License.